Kahlua was a bull with outstanding carcase qualities combined with performance, structural soundness and the ability to show himself off with real class. He is a sire of whom we think very highly, he has had a significant influence in our breeding herd. He is a Trait Leader for 200wt, 400wt, 600wt & RBY. Kahlua was purchased at Sydney Royal 2001 by Mr. A Hawker for $16,000, we retained a share. Mawarra have sold 7 sons at the Hereford National & 27 on property to $10,250 for an average of $5,000. We used one son, Norway, over heifers before selling him as the top priced bull at our 2003 on property sale. 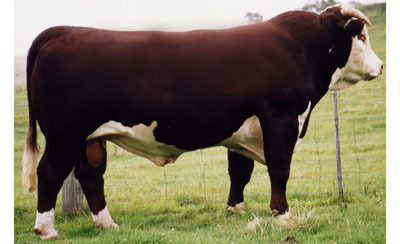 At Sydney Royal 2004 a Kahlua daughter M. Minerva 586 was top selling Hereford Female at $7,000 & two daughters exhibited by Strathvalley Herefords were awarded Junior & Reserve Junior Champions. In 2006 Strathvalley H S won Junior Champion Poll Hereford Female with another daughter. We consider his daughters to be our best cows they have near perfect udders and are very consistent breeders. His daughters have sold sons to $48,000, see Minerva 554, 551, 549, 544 & 555, Miss Titania 234 and Doreen 158 all featured on our female page. Their progeny are displaying impressive carcase traits, of note at scanning are the consistently high EMA & IMF.